Amanda Rockman’s interest in the culinary field began at an early age. Growing up in Katy, Texas, she was inspired by the dinner parties her mom would throw for friends. Rockman remembers seeing her mom dust the outline of the Kremlin on a chocolate sachertorte, thinking it was the coolest thing she’d seen. Her mom’s passion for food sparked the same interest in her. Rockman went on to attend The Culinary Institute of America in Hyde Park, New York, where she received her A.O.S. in Baking and Pastry Arts and completed an internship under Emily Luchetti at Farallon in San Francisco. Her career then took her to Chicago, where she worked at the acclaimed TRU, Spring, three Michelin-starred L.2o, and The Peninsula Hotel. Rockman also opened The Bristol, Balena and Thompson Hotel’s Nico Osteria as Executive Pastry Chef. 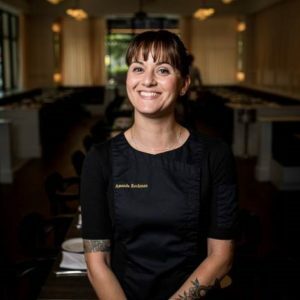 Having previously worked in Austin as Executive Pastry Chef at Fino and Asti, Rockman returned to Texas in 2015 as Executive Pastry Chef at South Congress Hotel, where she oversaw the pastry and bakery programs for in-room dining, banquets, and the hotel’s four food & beverage outlets: Café No Sé, Central Standard, Mañana Coffee, Juice & Bakeshop, and the Stephen F. Frostin’ ice cream truck. In 2017 Amanda was promoted to Corporate Executive Pastry Chef of all New Waterloo entities, where she oversaw all pastry operations at all New Waterloo properties. In 2018 she was promoted to Culinary Director of New Waterloo, acting as a resource and leader to all culinary teams. Rockman was named a James Beard Foundation Award Semifinalist in 2015, received the Jean Banchet Pastry Chef of the Year Award in 2011 and 2012, and was named Chicago Tribune’s Pastry Chef of the Year in 2012. She has appeared on Beat Bobby Flay, Top Chef Just Desserts, Hungry Hound, The Better Show, and Windy City Live.